A Colorado State Patrol trooper checks vehicles on Sunday, Nov. 4, in an effort to re-open Vail Pass on I-70, which was closed for several hours at different times throughout the day. VAIL — Road closure season is officially upon us with the first extended I-70 shutdown of the winter. 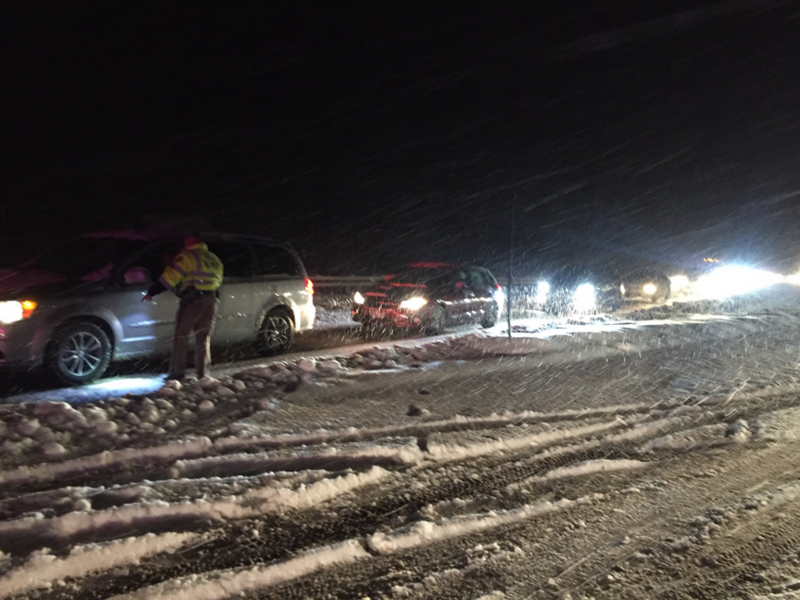 Snow, ice, and vehicles crashing into each other closed Interstate 70 Sunday afternoon. U.S. Highway 24 also closed Sunday east of Minturn because of several spun out vehicles, Jacob Best with the Colorado State Patrol said. While Sunday’s shutdown was the first extended one of the winter season, it was not the first. A series of storms that blew through a couple weeks ago closed Vail Pass, Tracy Trulove with the Colorado Department of Transportation said. The highway was closed at the main Vail exit, No. 176, due to high winds and blowing snow. Traction and chain laws are in place on Vail Pass and on the approach to the Eisenhower Tunnel, CDOT said. “If you are driving a vehicle that is not prepared for Colorado winter you should not be navigating the I-70 corridor,” CDOT said in a statement. Colorado’s High Country was hit Saturday, but travel conditions improved late Saturday and Sunday before the next wave of storms rolled through Sunday night, and continue through Monday morning. When a storm is predicted, maintenance crews begin 24-hour operations — rotating 12-hour shifts — until roads return to normal driving conditions, Trulove said.